UPDATED: New NRA Carry Guard Courses Not Allowing 1911’s? Granted this means you still cannot use your 5-shot J-frame revolver, but I don't have a problem with that. It is extremely difficult to put revolver-shooting students through a class with challenging courses of fire requiring multiple hits alongside students firing semi-autos with double-stack 15+ round capacity. What do you think of the NRA's retraction to allow 1911s and higher capacity revolvers? Do you agree that this was the right move? Are you glad that the NRA listened to the shooting community and took reasonable steps to address our concerns? 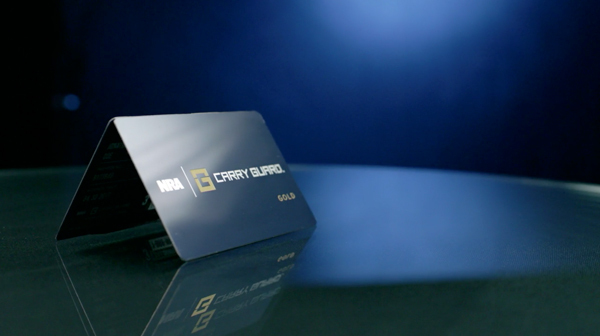 The new NRA Carry Guard program looks really impressive on the surface, but over the weeks and months as more details are revealed, gun owners are left scratching their heads at the implementation as well as some of the policies and decisions made surrounding this program. 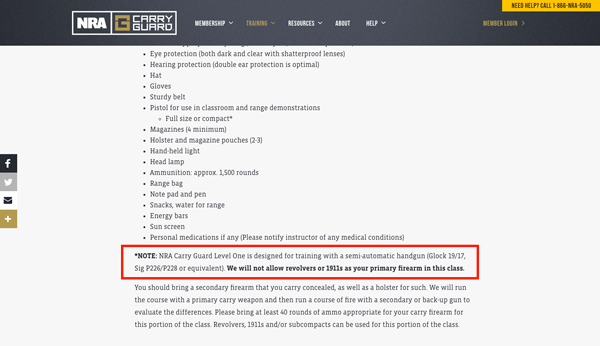 One of these is apparent on the course description for the new NRA Carry Guard Level One training course. NRA Carry Guard Level One is designed for training with a semi-automatic handgun (Glock 19/17, Sig P226/P228 or equivalent). We will not allow revolvers or 1911s as your primary firearm in this class. Now I can kind of understand them not allowing revolvers as a primary firearm to be used in this class. After all, I have always felt that a revolver shooter is best served by taking a revolver-specific defensive shooting course. The needs of a revolver shooter are very different from that of a semi-auto shooter. Classes–especially high round count courses–are also difficult to run revolver shooters through. Reloading is slower both at the firing line and at the prep table. But I was shocked when I saw 1911s included in the list of prohibited primary firearms. Tens of thousands of Americans carry John Moses Browning's classic 1911 design as their primary defensive handguns everyday in this country. It's not like the mode of operation is all that different from other semi-automatic handguns. Draw, Aim at the Target, Sweep Off the Safety, Press Trigger. That's it. Simple. Is it as simple as a Glock or similarly striker-fired gun (including SIG P320, Springfield Armory XD/XDm, S&W M&P Series, Ruger American or Ruger SR-series pistols)? No, there's an extra step in there. Are 1911s more difficult than using a DA/SA (Double-action/Single-action) pistol like a SIG P226/P228 or similar that is listed as being an acceptable platform in this course? Nope, not at all. Look, I understand that DA/SA pistols are generally not that complicated as far as drawing, aiming and pressing the trigger. But decockers, safeties, and a different trigger-pull weight between shots are troublesome for many new shooters. As an instructor, I find that newer shooters do better when they have fewer things to think about regarding their guns while they are also learning all the other stuff like actual shooting, techniques, and tactics. I am having a hard time wrapping my brain around this exclusion of one of America's top handgun platforms. It just doesn't make any sense. And this is coming from a guy that prefers using a Glock for self-defense. Then there's the issue with the cost. Now granted, the NRA Carry Guard Level One course is a three day course. However, the price is $850! You do not have to be a Carry Guard member in order to take this training, but there is not even a discount offered for NRA Carry Guard members. I don't doubt the quality of training will be excellent as there are some pretty legit instructors involved, but there are some amazing multi-day courses you can take from phenomenal instructors in many places across the country that cost less than this NRA Carry Guard training. We are just launching our new Guardian courses at ConcealedCarry.com including the Guardian Essentials – Pistol course (equivalent to a level 1 course). We are still in a sort of “beta” phase with these, but we are very excited about the future with these courses as they will be really pushing the envelope for real-world self-defense and CCW training for citizens. This one-day course costs $350, but that INCLUDES the ammunition! (Currently only for 9mm shooters at this time, hoping to add other calibers in the future.) Plus we offer a discount for Guardian Nation members. We want to provide as turnkey an experience as possible while giving world class instruction. There is still time to get in our first Guardian Essentials – Pistol course on June 23rd in Denver, CO. You can sign up here. Tell us how this policy from the NRA regarding their Carry Guard courses affects you. Do you carry everyday? Do you carry a 1911 or revolver for personal protection? What do you think about the NRA's decision to exclude shooters like you? In response to clear feedback surrounding the NRA Carry Guard Level I course announcement, we have modified the required firearm platforms as well as our site language to clearly articulate how firearms will be used in the class.